Starting today, current users of Windows 7 and Windows 8.1 will be able to reserve a free upgrade to Windows 10 once the operating system is released in a few months' time. 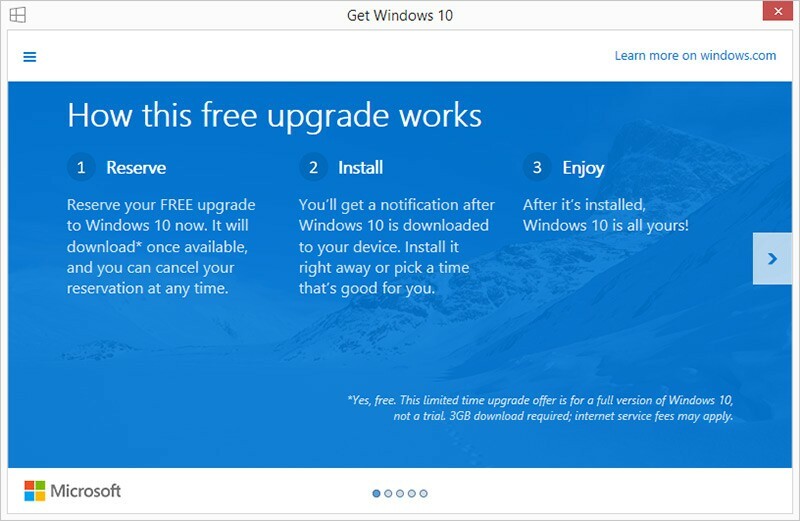 And yes, the free upgrade will give you a full copy of Windows 10, not a trial version. Windows 7 and 8.1 users can reserve their upgrade to Windows 10 through a new application that has appeared on the aforementioned versions of the operating system, following the installation of Windows Update KB3035583. A windows flag icon appears in the notification tray, and clicking on it brings you to a screen that allows you to reserve your copy. The app, which also advertises some of Windows 10's key functionality, indicates that Windows 10 will automatically download, after which you'll receive a notification informing you that the new OS is ready to install. You also have the option of receiving this notification through email. Once the OS is downloaded, you can install it whenever it suits you. Microsoft is set to launch Windows 10 next July 29th, in time for the back-to-school season and the release of new devices, which manufacturers are already starting to announce. This new Windows 10 app that has appeared on Windows 7 and 8.1 is all part of Microsoft's advertising process as the company looks to target one billion installs of the OS over the next three years.